There have been several truly influential lures that have come throughout the history of bass fishing and the Senko is one of them. When Gary Yamamoto first designed the Senko he was looking for a twitch style bait similar to that of the already popular Slug Go however came to realize that this Sharpie Marker style looking worm was the key for a more finesse type of fishing. The Senko started as nothing more than an idea on a napkin while out to eat and has become a phenomenon in the fishing industry with now to date countless copy cats trying to match the fish catching qualities designed in this bait. The idea behind the Senko is found in it's simplicity and subtle yet seductive shimmy as it falls when weightless Texas rigged or on a wacky rig. 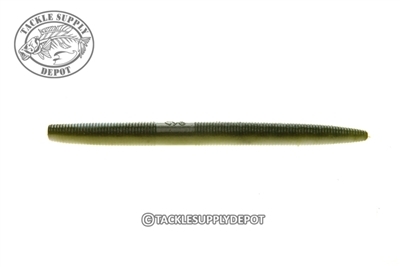 Featuring a thick round, ribbed body which is loaded with a large amount of salt and the perfect plastic formula to give this worm the action others wish they could match. The Senko has staked it's place in fishing history and is here to stay.